Small, light, and comfortable, the classic, original design Inton unit has been in production for many years. The Servox Inton Speech Device was developed in order to help patients make themselves understood as soon as possible after their laryngectomy operations. 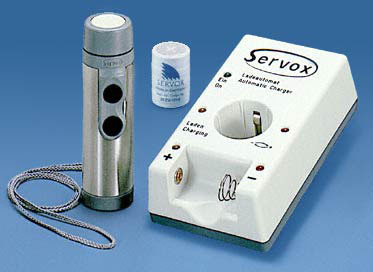 The Servox Inton essentially takes the place of vocal cords. When placed against the throat, the device generates sound vibrations and transmits them into the vocal tract, mouth and nose area. A clear and intelligible voice emerges through the natural speech movements. The Inton's dual buttons allow more flexibility in pitch, volume and intonation. Regular price: $925.00. Shipping is free for Prority mail or $50.00 for UPS Second Day Air within the Continental US including Alaska and Hawaii. International shipping is $30.00 for USPS First-Class Package International Service.